Apologies for the terrible title, I defy you to come up with something that rhymes with vegan! Title aside, I want to talk about my attitude when it comes to food intolerances, food preferences and allergies. As a curious cook I embrace the challenge that is presented when I have to prepare food for someone who is gluten intolerant for example, or vegan. Though I realise that there is a huge difference between those who have chosen to be vegan or vegetarian and those who have a genuine physical reaction to certain foods such as those with coeliac disease or an allergic reaction to an ingredient. However, I do think the same respect should be shown and I would never serve anything to a vegan or vegetarian that had been in contact with meat. When cooking for those with specific dietary requirements I often look to food from other cultures for inspiration. The Indians are very good at preparing vegetarian dishes because they have a long tradition of cooking without meat and a fair chunk of their population have always been vegetarian due to various religious restrictions. Chinese and Vietnamese cuisines also have long experience in cooking vegetarian cuisine often because there was no or very little meat available to those who were not well off. Mexican, Italian and French cuisines also have some great peasant dishes that are vegetarian usually involving some form of dried bean or an abundant seasonal vegetable as a starting point. I prefer to find a recipe that has always been vegetarian rather than make a pale imitation of a dish that usually contains meat. 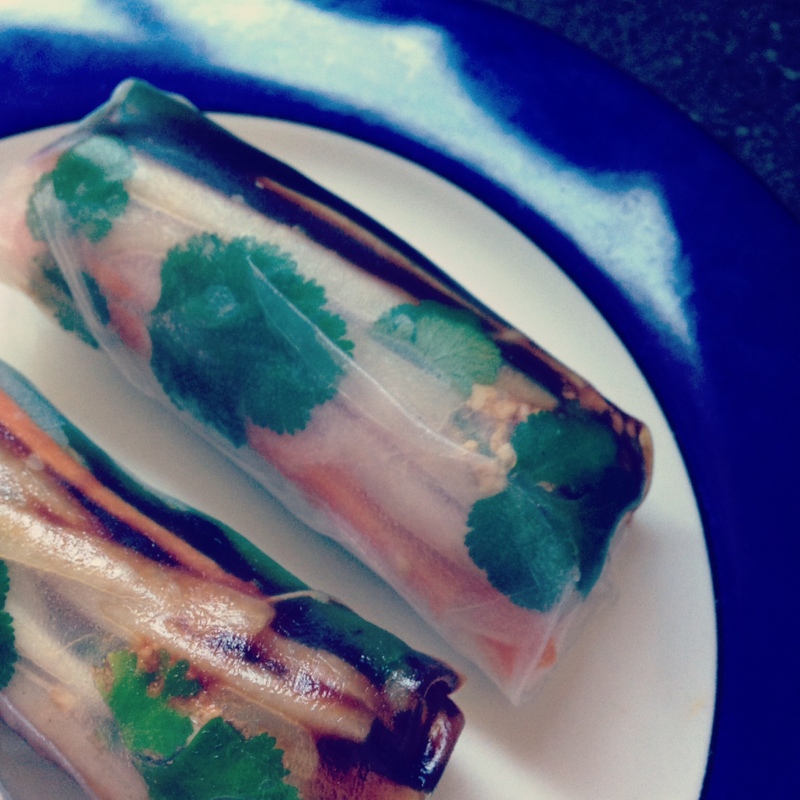 Vietnamese rice paper rolls are a versatile dish that can be made with meat, chicken, seafood or tofu. The ones I made here are vegan but you could easily substitute some barbeque pork or a prawn for the tofu that I have used. Heat a little oil in a heavy based frypan, add the chili flakes and garlic and fry for a minute, add the soft tofu and the five spice powder. Stir to ‘scramble’ the tofu and cook until well incorporated. Stir through the spring onions and soy sauce and set aside to cool. To compile the rolls: Have a bowl of warm water and a wooden board at the ready. Have your other ingredients and your tofu nearby. Wet a rice paper sheet in the warm water and lay it out on your board, Smear a little Hoi Sin sauce on the sheet and then place a a couple of coriander leaves and a small amount of rice vermicelli noodles in the middle. Top with a small amount of all the other ingredients making sure you have enough for all twelve rolls. Turn the sides of the sheet in and then roll up from the bottom finishing with the seam side down. Place on a plate and continue until all the rolls are done. Serve with a dipping sauce of your choice.